You may be noticing cracks on your walls or floors. 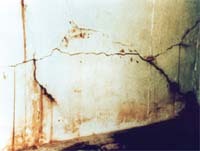 These cracks can be hairline or larger depending on the amount of water pressure around the outside of the foundation. You may have noticed moisture or dampness on the floor or walls after a heavy or saturating rain. You may have noticed some mold or mildew forming on the walls. 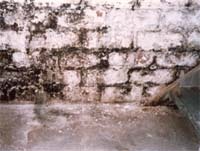 Mold occurs due to a moist, damp environment. Mold and mildew cause such problems as allergies, headaches, sinuses and other health issues. 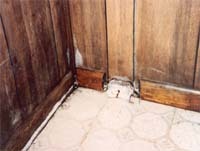 You may be noticing dry rot on the walls, baseboards, joists, floor and bottom of a wood staircase. This is due to moisture coming through your walls and floor. This type of fungus is also a major health concern. 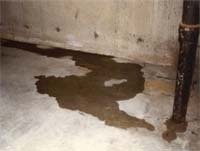 If you are experiencing water seepage, your foundation is already in an advanced stage of failure. At this stage, your foundation may be at risk for serious structural issues such as bowing/buckling of the walls and floor, and even collapse. You may also notice mold, mildew, musty orders, bugs, and even mud after a heavy rain. 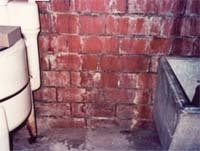 You may have noticed some rust on your furnance or fixtures in the basement. This may occur simply from dampness through your walls and floor.